Most of our jewelry is handcrafted with 950 silver, which is made by melting 95 percent pure silver and mixing it with 5 percent copper. This gives 950 silver the ideal flexibility for bending and forming our jewelry. In comparison, sterling silver is physically stronger but of a lower quality than 950 silver because it’s made with 7.5 percent copper and 92.5 percent pure silver. 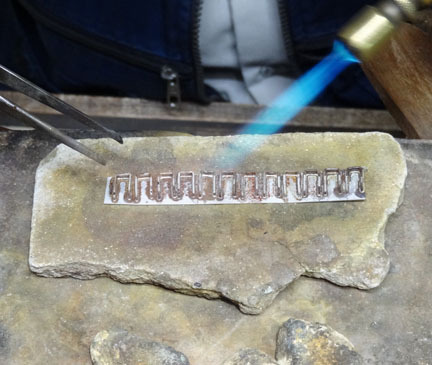 Our artisans make the jewelry by melting the 950 silver at 850 to 900° C (454 to 482° F), then putting it in moulds to form flat shapes or wires, which are cut to desired dimensions. Symbolic patterns or contemporary designs are created with the wires and carefully soldered to the flat shapes. Most pieces are further enhanced with all natural semi-precious stones or sea shells (which are not artificially colored or altered in any way). Each stone or shell is cleaned of imperfections, smoothed, cut to the exact size needed to fit spaces in the pattern, and glued in place with a special adhesive. In the final stage, we polish the piece to give it a sparkling finish or a muted antique look.